Alright, so we'll admit, we're about a year late on this one. Things happened -- we self-published another fanzine, we interviewed a few more comic pros, we covered a few comic conventions -- that got in the way of covering the new Young Animal imprint we're so stoked for. Besides, I enjoy waiting to read the first few issues in one sitting versus only reading the first issue and deciding if the series is going to be a hit or not... sometimes these things take a few issues to develop momentum. First of all, who is Cave Carson? The 1960s were an interesting time for DC comics; as the cultural shift would have it, the early 60s saw super-powered characters gaining in popularity again (thanks mainly to the Comics Code Authority putting a halt to horror and crime comics). Before super-powered characters became the 'big thing' in the Silver Age, DC tried out stories about normal humans (usually adventurers or researchers) dealing with extraordinary situations. 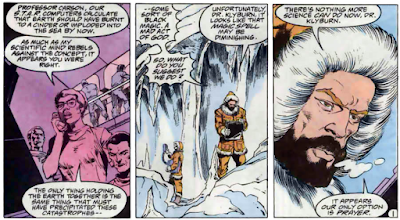 Hence, we were introduced to The Challengers of the Unknown (a team of human adventurers), the Sea Devils (a team of human underwater adventurers), Rip Hunter (a normal human who invents a time-traveling device), the Suicide Squad (a group of human military operatives) and Cave Carson (a human subterranean adventurer/researcher). Created by France Herron and Bruno Premiani, Cave Carson debuted in The Brave and the Bold #31 (1960), and lead his expedition team to explore lost underground civilizations and fight subterranean monsters; the stories were a fusion of adventure and science-fiction. I'm sure these tales had their time and place, but I never really had any interest in them -- because really, how many kinds of stories can you tell about a spelunker before they all start to seem similar? 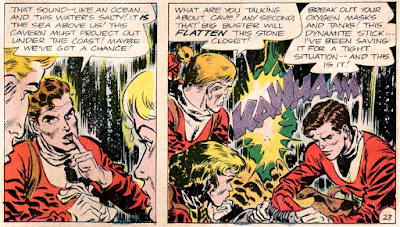 Panels from Showcase #48 (1964). Art by Lee Elias. 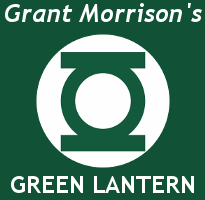 He was featured in a few issues of DC's 'try-out' titles, Showcase and The Brave and the Bold, in the early 60s -- but as super-heroes became more popular, he and the rest of the 'non-powered human adventurers' were shuffled off into comic book limbo. 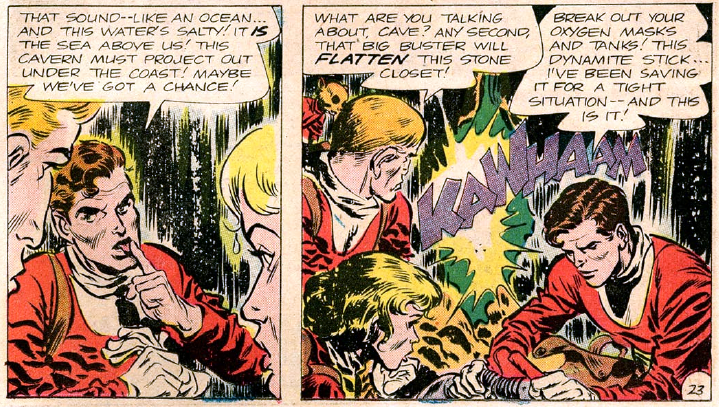 Roughly twenty years later, Cave Carson was included as a member of the aptly named Forgotten Heroes (the other members were also 1960s characters who had gotten lost in comic book limbo). The Forgotten Heroes only appeared a few times pre-Crisis, and afterwards Cave Carson would remain on the fringes of the DCU and occasionally pop up when a writer decided to use him. With nothing else to offer other than his own natural athletic ability and his Mighty Mole digging machine, Carson doesn't bring too much to the table unless the story required someone with expertise in geology. Panels from War of the Gods #4 (1991). Art by George Perez, inker unknown. 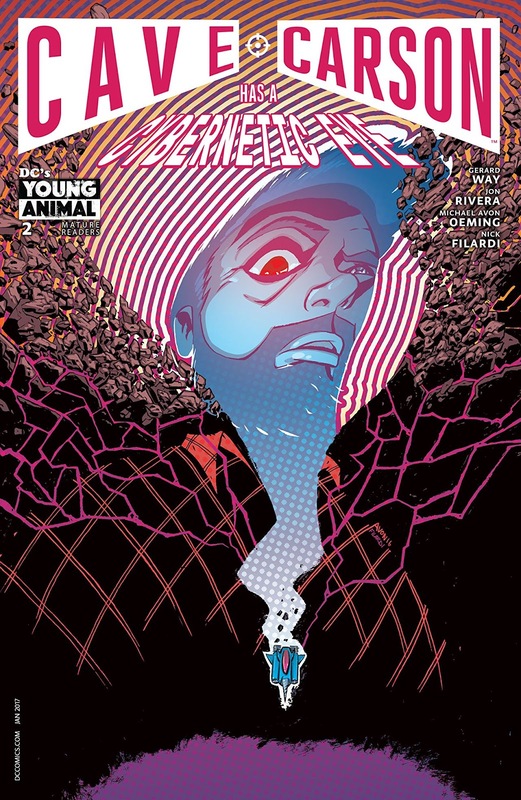 It was a bit of a surprise that Cave Carson would be headlining one of Young Animal's launch titles (especially under a mature readers label). I was genuinely curious to see what they could do with this character in an interesting way. 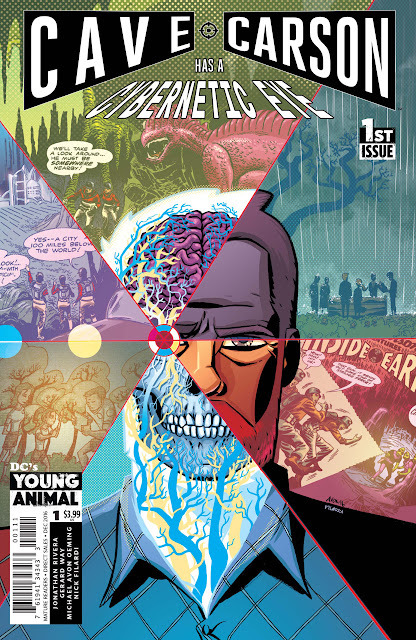 Going into Cave Carson Has A Cybernetic Eye, I'm just familiar enough with the character to feel a bit of nostalgia (probably due to him being around since the 1960s) but not so familiar with him that I'll get outrageously upset if they retcon his entire origin. Upon diving into the first issue, my first discovery was that this book's art was a little more cartoony than I was expecting -- it's very reminiscent of Bruce Timm's art style (as seen in Batman: The Animated Series and Superman: The Animated Series) -- but nevertheless fit with the atmosphere and mood of the story. Illustrator Michael Avon Oeming's layouts are astounding to look at and really contribute to the fluidity of the narrative. 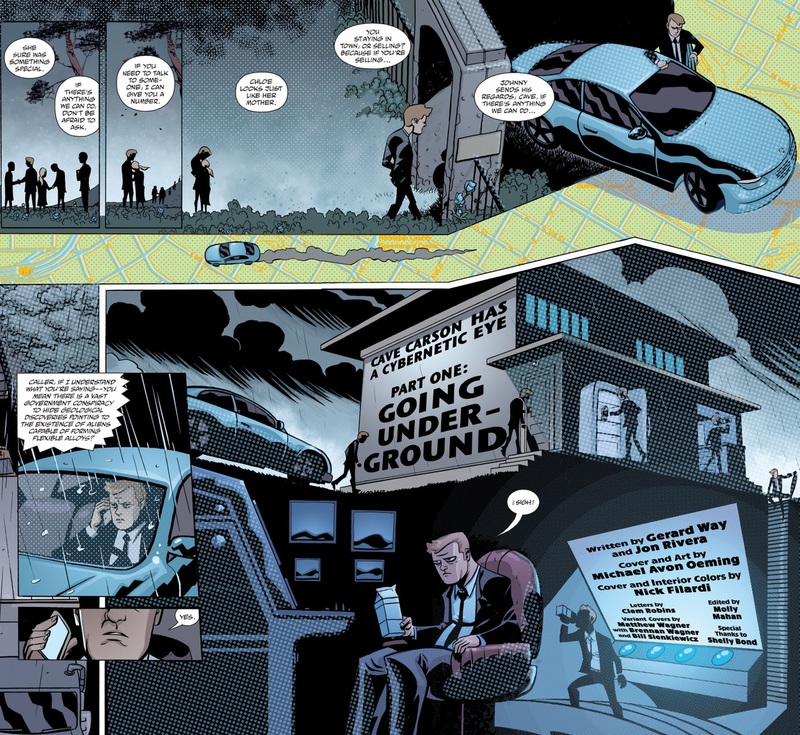 Among other things, Oeming is known for his work on Powers (Image/Icon Comics) with writer Brian Michael Bendis -- so if you're wondering why his art looks familiar, now you know. While I'm mentioning the visuals, I'm going to remark that colorist Nick Filardi's choices of bright vibrant colors (plenty of purples, pinks, greens and blues) compliment Oeming's psychedelic backgrounds and make the pages 'pop' in all the right places. Written by Gerard Way and Jon Rivera, the story itself is fast-paced and absorbing. It's not very wordy, has plenty of action and makes for a quick read. There's a little bit of strong language, but nothing overly offensive. There's a few times that I had to pause in order to take in everything (visually) on the page -- as mentioned before, Oeming and Filardi make a great team. I'm tempted to tear a lot of these pages out of the book and turn them into black light posters [...but I won't, for obvious reasons]. A little bit of Cave's history was expounded on; since the last time readers had heard from him, he'd been married and now has a daughter named Chloe (who is a University student when this story takes place). For the long-time Cave Carson fans, there's a few references to Cave's earlier adventures with Superman and a few recognizable DC characters appear in the story [...including a hero who was introduced in the late '80s, but quickly vanished into comic book limbo. No spoilers, but if you want to know who, click this link]. There's nothing too cerebral about it and it won't make you challenge your belief system or open your eyes to new doorways beyond reality. In short, it's an entertaining sci-fi action-adventure story with a few f-bombs and pop culture references thrown in for good measure. While I thought the entire twelve issue story arc was entertaining as hell and the visuals were quite mesmerizing, I *really* kept reading to see if other legacy DC characters would make cameos (or if any earth-shaking retcons might occur). After reading this series a few times, I positively CANNOT discern whether this is happening in a new DCU, an imaginary world, or a mish-mash of both. Does it really matter? No, it doesn't. It's still an entertaining read. 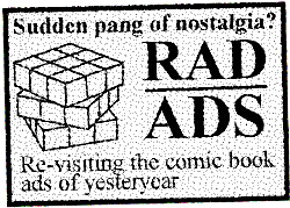 As Way discussed the idea of a new DC comics imprint with Dan DiDio and Jim Lee at the California DC comics offices -- something that re-created the weirdness of the early 90s Vertigo comics -- DiDio suggested that they move in a direction "outside of what Vertigo had done in the past". DiDio explained that a new imprint required a new energy, a different trajectory -- even if it used old characters. DiDio handed Way a copy of The Encyclopedia of the DC Universe and suggested he go digging (presumably for obscure DC characters he could revitalize). Special Powers/Abilities: Highly intelligent, with a natural gift for his area of expertise; one eye is cybernetic. And that's it. There is some history involving his old crew, and a mention of their dip in popularity once the modern age of superheroes began (and a bit about him stealing a vehicle called the Mighty Mole from his employers), but statistically he was just a smart expert in geology with a cybernetic eye. I was in love." Preliminary research on the origins of the cybernetic eye yielded nothing, so DiDio got involved and discovered that Cave Carson and his cybernetic eye first appeared in the last few issues of Resurrection Man v1 (1997). Upon further inquiry, it was revealed that the Resurrection Man creative team (Dan Abnett, Andy Lanning and Jackson Guice) never explained how or why Cave Carson had a new cybernetic eye, and the reader was left to assume that it had happened in some sort of off-panel adventure -- essentially leaving an opening for a new creative team to tell that tale. So now you know the rest of the story. As an added bonus, the first six issues of Cave Carson Has a Cybernetic Eye include 3-page excerpts from Thomas Scioli's Super Powers volume 1. Scioli has a knack for making our childhood toylines entertaining again (see: 2014's Transformers vs GI Joe maxi-series by IDW comics), and this time he works his magic on the Super Powers Collection toyline we grew up with. In contrast to Cave Carson's vibrant digital coloring and crisp inks, Scioli's back-ups look like they were drawn on yellowing parchment paper and colored with coloring pencils -- the entire effect gives it an organic D-I-Y feel that brings up nostalgic memories of that really talented kid back in elementary school who was writing, illustrating and coloring his own in-house comics. [Don't let that last line mislead you, I really dig Sciloi's work.] Erik Tramontana, a major Super Friends enthusiast, wrote a really nice run-down of the Scioli Super Powers back-ups for us back in April 2017. Super Powers proof-of-concept page. Everything by Thomas Scioli. Originally, for his Super Powers back-ups, Scioli wanted to use all the characters you saw in his proof-of-concept page (as shown in the image above), but DC editorial told him most of the characters on the page were not available for use. So, Scioli re-started from scratch and dug up obscure DC characters he could build a story on [are you seeing a pattern here?]. He managed to dust-off quite a few early Jack Kirby creations, but ultimately settled on Arin the Armored Man, the evil Sphinx, a BMX-riding Batgirl, a bunch of Green Lantern Corps members we hadn't seen since the '80s, and the Wonder Twins (with Gleek). 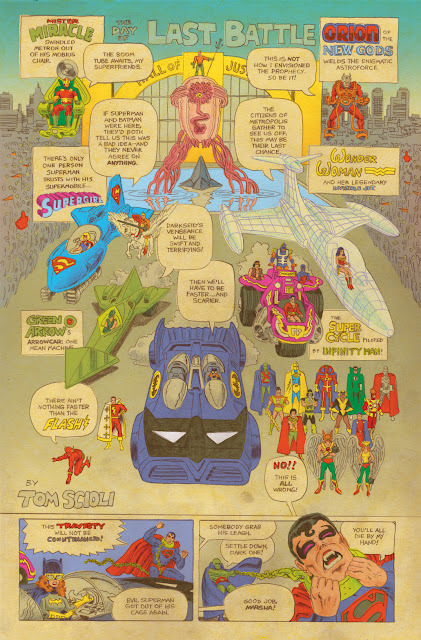 As Scioli's 3-page scripts were being approved by DC editorial, he was gradually able to slowly sneak more A-list DC characters into the story. "Gerard [Way] told me that early on in the curation of the Young Animal line, he wanted me to do a Demon series, but that the character was unavailable. I remembered Alan Moore and Joe Orlando’s Phantom Stranger origin story that featured Etrigan the Angel. It’s one of those things that seems simple and makes total sense, but it takes a genius like Moore to point it out: like all demons, Kirby’s Demon began life as an angel. I wrote a superhero action adventure for the character. But what does a superhero fight at a time when even Satan is an angel? I figured it would have to be something Lovecraftian. I was weaving an elaborate Bayeaux tapestry of the DC Universe." As a side note, Gerard Way and fellow My Chemical Romance band-mate Ray Toro recorded an original song called 'Into the Cave We Wander' (an obvious nod to Cave Carson). 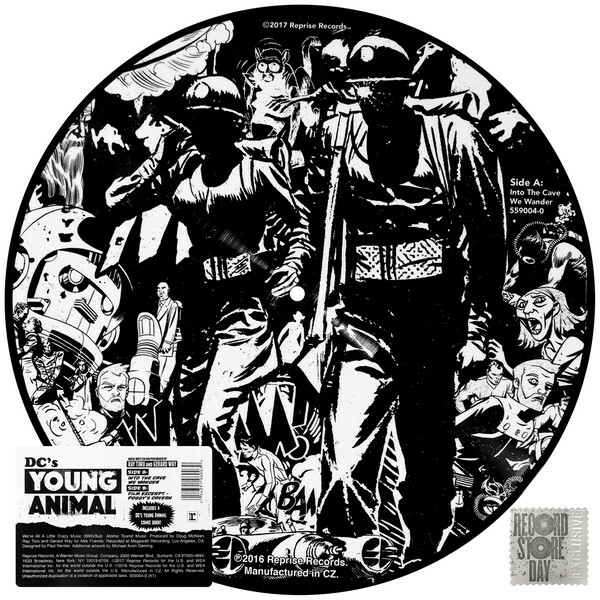 This song was distributed on Young Animal Record Store Day vinyl records and cassette tapes (with the B-side being a dramatic reading of a fictitious geology documentary called 'Poggy's Cavern'. I really have to give credit where credit is due: between the release of the ashcan, vinyl record and cassette, Gerard Way and company did an exemplary job of keeping Cave Carson (and the Young Animal imprint) true to the spirit of being bizarre, entertaining and unpredictable in a 'make comic books worth talking about' kind of way. I have high hopes for the Young Animal imprint -- much like the Berger-edited Vertigo of the early 90s I grew up with, they are taking older, obscure DC characters and breathing new life into them. Since current Vertigo is mainly created-owned characters, I'd argue that Young Animal is more 'Vertigo' than Vertigo is. I can't wait to see what the future holds for Cave Carson, and if we're going to get any full-length Scioli Super Powers comic books or anthologies in the near future. Oh, and there's a review of Shade the Changing Girl you can check out as well.